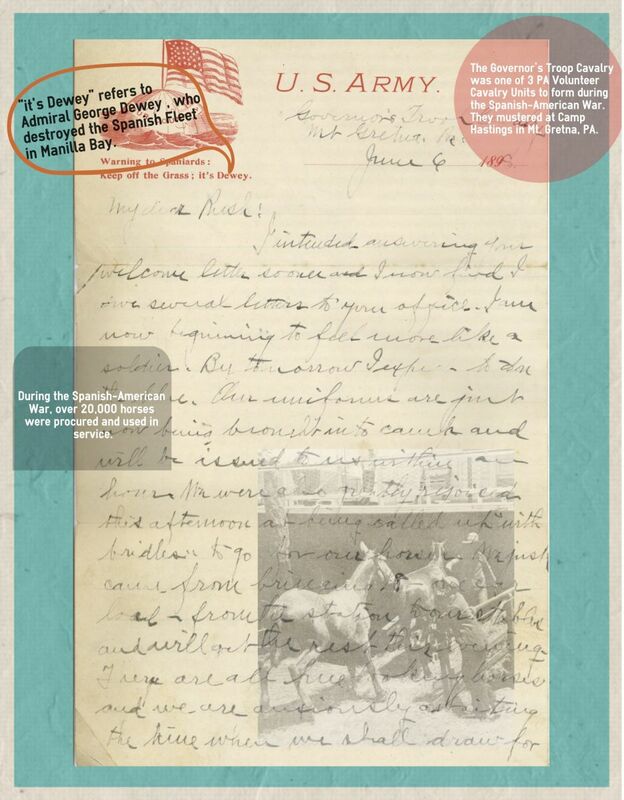 Tucked within the pages of a Tax Assessment Book, a letter was discovered from a Franklin County volunteer in the Spanish-American War. 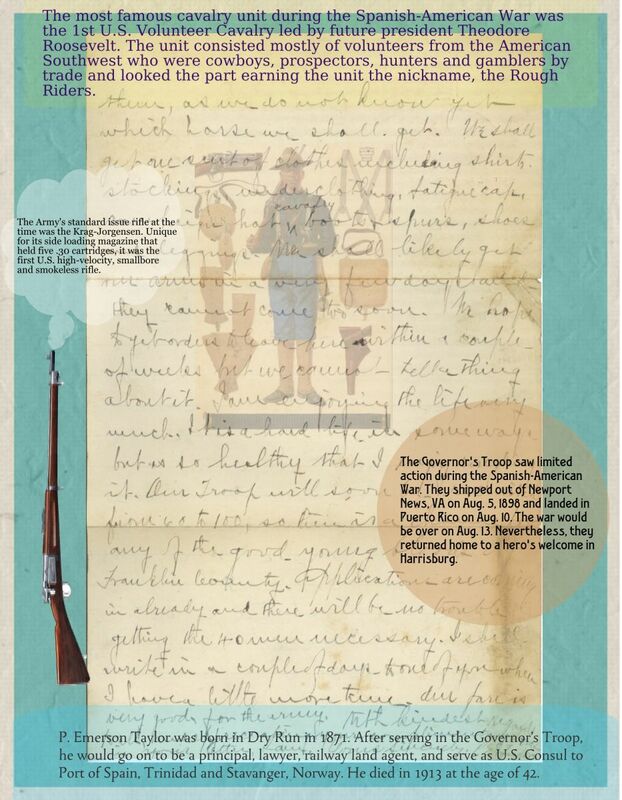 Here is the letter along with some information about the Spanish-American War. I intended answering your welcome letter sooner and I now find I owe several letters to your office. I am now beginning to feel more like a soldier. By tomorrow I expect to don the blue. Our uniforms are just now being brought into camp and will be issued to us within an hour. We were also greatly rejoiced this afternoon at being called up with bridles to go for our horses. We just came from bringing 18 [horses] - one car load - from the station to our stables and will get the rest this evening. They are all fine looking horses and we are anxiously awaiting the time when we shall draw for them, as we do not know yet which horse we shall get. We shall get one suit of clothes including shirts, stockings, underclothing, fatigue cap, campaign hat, cavalry boots + spurs, shoes and leggings. We shall likely get our arms in a very few days and they cannot come too soon. We hope to get orders to have here within a couple of weeks but we cannot tell a thing about it. I am enjoying the life very much. Tis a hard life in some ways but is so healthy that I enjoy roughing it. Our Troop will soon be recruited from 60 to 100, so there is a chance for any of the good young bloods for Franklin County. Applications are coming in already and there will be no trouble getting the 40 men necessary. I shall write in a couple of days to one of you when I have a little more time. Our fare is very good for the army. With kindest regards to all and appreciating your complimentary words in your letter. 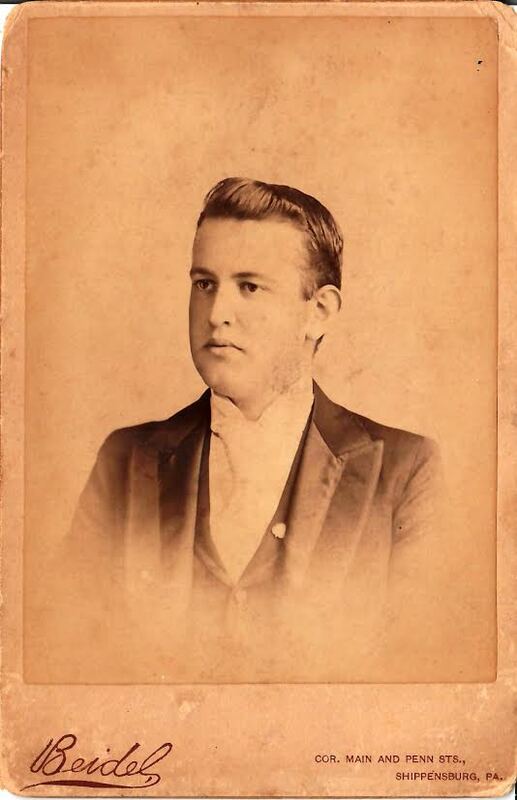 Photo of Taylor when he was a student in Shippensburg in 1889.